Bob Torbet led the March meeting with 13 in attendance. We had 1 guests beside the regulars. The minutes from the previous meeting were read and accepted along with the treasurers report. Bob missed the last meeting because he was at the Cincinnati baseball camp for old guys. The report was lengthy; but the short of it was, Bob got a hit and drove in a run. His grand finale was a run to first that tore his pride, thus ending his glorious career to a debilitating injury. He can now enjoy his retirement, knowing that he gave it his all while he had the chance. Rah! Rah! Bob!!! Touring season is just around the corner and the club was busy discussing the possibilities for the summer. So far, we have a trip to Auglaize Village, a combined tour with the Tickin' T's to the Ohio Caverns, Mel's trip toward Fort Recovery, the Ohio Jamboree, and the Covered Bridge Tour in Northeast Ohio. We're still holding out for additional tours of a few car collections and the NKP Railroad Museum. Joe Bell is looking for a pair of 21" split rims for a 1925 coupe that he picked up down south. He helped the daughter of a deceased general identify the Model A and Model T parts; so, she threw in a free 1916 engine/transmission for the help. We are all here to help each other get these T's back on the road. Also, as many of you may already know, Mel Miller, of wood plan fame, passed away last year and has left a void in the Model T community. His daughter tried to continue the business with very little success. She doesn't have the knowledge to identify all of the plans. Fortunately a fellow in Canada has some plans that are available. 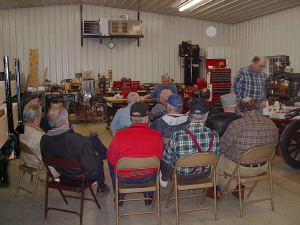 The cracked drums that were discussed in last month's newsletter prompted a demonstration at the March meeting on cracked cranks. The broken crank is easy to see. It's the almost cracked crank that is a little more difficult to detect. It seems that even a well trained eye and ear can be fooled into thinking that a good one's a bad one and vise-versa. In the picture to the left we see the result of a bad crank hitting the floor before the technical talk at Jack Putnam's on Friday night of the 2002 All Ohio Model T Jamboree. 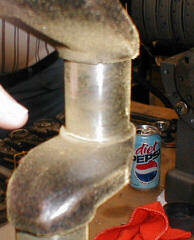 you'd be hard pressed to hear just one by itself and determine that the crank was good or bad based on this method. the solution are drawn to the disturbance in the magnetic field created by a flaw in the metal. The result is a visible line of flakes around, or in the crack. The question still remains to be asked. Are the flaws the result of the forging process or the result of the stress of driving the Model T? An argument could be made that the forging process creates the stress in the metal that will someday result in a broken crank. The subject of welding cracks was also bantered about. It comes down to a meatter of trust and the availability of useable cranks. Jack admits that he has had some cranks welded by the same fellow that welds for the tractor supply down the road. There hasn't been a complaint and to be truthful, you can't tell the welded ones from the others in a row of cranks. 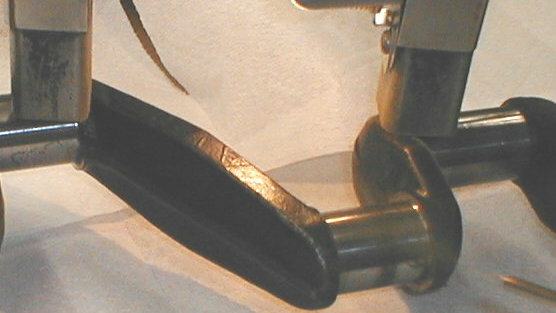 There is still the potential stress within the forging that leaves it vulnerable to cracking. As more and more cranks break and are thrown away, there will be a shortage that will drive the price of a crank higher. For now, cranks are still available for less than $150. The other alternative is the New Zealand crank that is poured out of iron. The iron has been formulated to be between white and grey iron. The grain structure of the iron is strong like white iron and also carbon structured like grey iron. The combination has created a counterbalanced crank that is a fine replacement for the old forged cranks. The downside is the price. Check your "Model T Times" or "The Vintage Ford" for details. The last I looked they were hovering around $1500. So far, their track performance is good. Time will Tell! This all still goes back to the fact that at one time we would throw away a part that we were replacing . Now, maybe, we should hold on to it for the next generation of possible replacement parts. Somthing in my 1926 is blowing fuses right and left. I tried to disconnect all of the wires to isolate the problem without the desired result. The wiring mess did allow me to drive the car through the winter without lights or horn. Somewhere is this picture is a toggle switch that had the center tap attached to the coil box lead, one wire to the magneto, and one wire to the battery. It worked fine, but didn't solve the root problem. Its now rewired and fuse blowing again. A good Model T electrician would be appreciated. This is just an example of one of the buildings that we will see when we visit Auglaize Village near Defiance. This tour is planned for June 26th and will involve some back road travel that was used on one of the club's previous Jamborees. 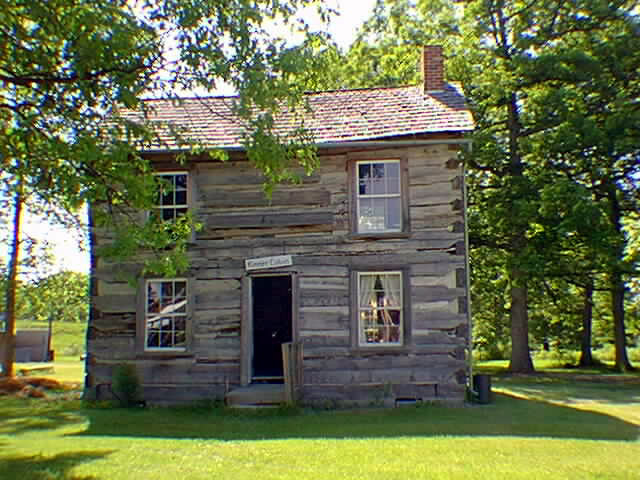 The two story log building, the Kinner cabin was moved from the Kinner Farm, west of Ayersville, Ohio in 1973. 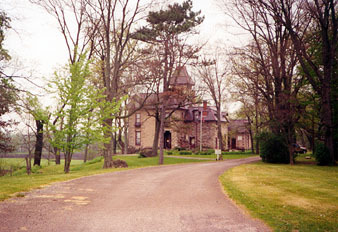 Constructed about a century ago, the structure features an unusual dove-tail corner joint system. This structure has been restored with a new fireplace and is currently being finished to its previous state. 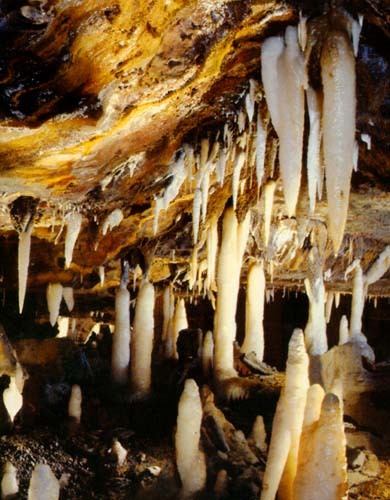 The cactus plant formation is just one of the beautiful formations that we will see on our tour of the Ohio Caverns on July 10th. This visit will coincide with a visit of the Tickin' T's of Central Ohio. We will rendezvous for a picnic lunch. This will be an opportunity for some great fellowship and a mini Model T show at the same time. Let's have a good turnout to show them that we can tour with the best of 'em. 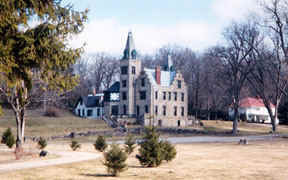 We will also visit the Piatt Castles on this trip, provided we have enough time.